Caregiving has become "an unexpected second career" for many people in their 50s and 60s, says Tamar Shovali, who studies gerontology and teaches at Eckerd College in St. Petersburg, Fla.
"And distance caregiving is really difficult," she says. If moving nearer to each other isn't an option, how can you provide care and support for an aging parent from afar? Make the most of periodic visits to your parents' home, says Amy Goyer, AARP's family and caregiving expert. Look around to see what sort of shape it is in, and consider modifications (handrails in a hallway?) that might make it safer and more convenient. Meet briefly with any doctors your parents see regularly so you can develop a connection. Ask questions. Make sure that a prescription written by one doctor isn't conflicting with a prescription from another. This will make it easier to continue managing a parent's medical care by phone. Also, choose a point person who lives nearby and is willing to visit your parents regularly to note any changes in their health, behavior or daily abilities. "You can talk to them on the phone, you can even Skype and still not get a full picture," Goyer says. You need someone on-site to tell you what they're seeing. This person could be a cousin, neighbor, good friend or someone from their faith community. If no one is available, Goyer suggests hiring a "geriatric care manager," a growing profession because so many elderly people don't have relatives nearby. The website caremanager.org is one place to start searching for someone to hire. Even if your parents live in a facility, rather than at home, see that someone visits them regularly. Small problems can get out of control quickly, says Goyer. Even at good assisted-living facilities, "there are a lot of services you expect," she says, and you have to make sure they are being delivered. Baby Boomers are increasingly using tools like video chat and e-mail circles (Google Hangouts is one example) to stay connected with elderly parents, says Duane Matcha, professor of sociology at Siena College in Loudonville, N.Y.
By creating a Google Plus group that includes parents, adult children and even grandchildren, Matcha says, distance caregivers can create a virtual support system. There is strength in numbers: The more relatives and friends who are aware of an older person's daily habits and experiences, the more likely someone will notice changes that need attention. 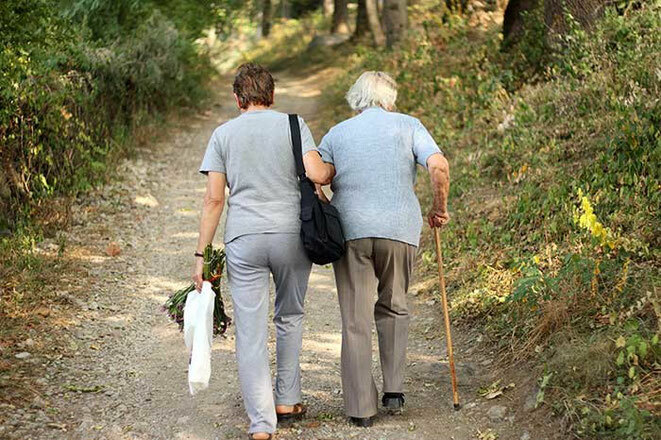 New technology for distance caregivers has been emerging rapidly. Shovali recommends an app called Reunion Care that keeps all of a person's medical records in one spot, plus contact information for doctors. "Friends and family can log in and put the information in," she says, "and that can be done in person or at a distance." Cameras and motion sensors can help you make sure a parent is moving around the house normally, and monitor any visitors as well. Wireless blood-pressure cuffs send data to a remote user, and electronic pillboxes can let you know whether elderly parents have taken their medication. You can even buy a door lock that can be coded to let in certain people on certain days. "Let's say on Tuesday and Thursday you have a paid caregiver coming to help your mom take a shower," Goyer says. "You can give them a certain code that's only good on Tuesdays and Thursdays," and then use a motion-sensor camera to make sure that caregiver arrived on time and left as scheduled. It's difficult, and often heartbreaking, to approach your own parents about changes in their mental and physical abilities. Asking them for access to their e-mail or voice-mail passwords to help protect them from online or telephone scams, for example, can be perceived as an affront to their independence. It may be even harder to discuss planning for end-of-life medical care or burial wishes. But have these conversations early, before critical situations emerge. Shovali says a document called the Five Wishes Living Will (available at www.agingwithdignity.org) can help start the conversation about end-of-life planning. It's written in clear language, "not in legal speak or doctor speak," she says. As for discussing whether parents should stop driving, need help managing finances or should consider moving into assisted living, Goyer says it's valuable to "make very specific observations." For example, take a ride with them in their car. "You can say afterward, 'I really noticed you seemed to be having trouble making left turns,' or 'I noticed a lot of dings on the right side of the car,' " she says. That can lead to a conversation about whether driving is still safe. Driving is an especially sensitive subject, Shovali and Matcha say. If elderly parents live in a suburb, giving up driving can mean loss of independence and access to many things. So find a transportation service, friend or hired caregiver to drive to medical appointments, shopping trips and social outings. In general, Goyer says, approach difficult subjects with an "I'm here to support you. I'm not here to take over your life" attitude. Give thought to which relatives and friends should be involved in the tough conversations. "You may be doing most of the caregiving," Goyer says, "but your brother might be the one your parents listen to." You also might want to bring in a professional, perhaps a trusted doctor or lawyer, to offer advice. Many communities offer transportation and meal delivery for elderly residents; call and find out what's available. Even if your parents don't need much support, you might want to find clubs or organizations where they can socialize. You don't want your parents becoming isolated. Make sure they know where to reach old friends who may have moved, and tell friends and acquaintances if your parent is moving to a new home. Finally, find a support group for yourself. Just because you aren't providing daily care in person "doesn't mean that at a distance you don't need support," Shovali says. Along with encouragement, you might find good practical advice from people with more experience caring for parents. Information from Melissa Rayworth, Associated Press.